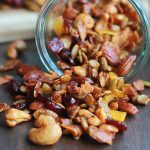 Trail mix, considered to be the ideal snack for camper or hikers because it’s an easy on the go nutritious energy boosting snack. Well, I’m no hiker or camper, just a super busy person who loves having a quick delicious snack for a quick pick me up in the late afternoon or after a run. 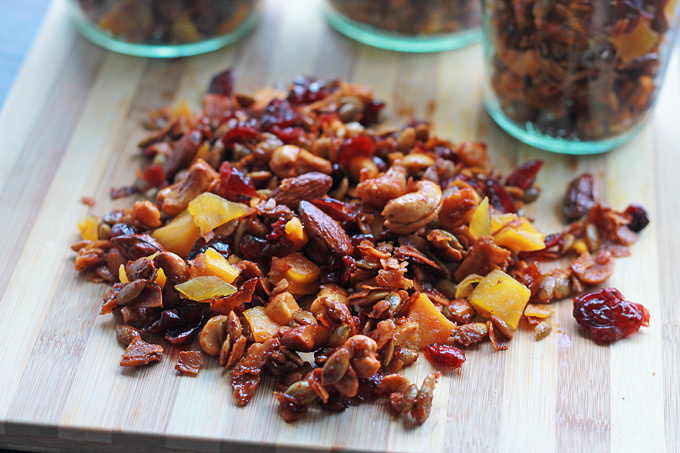 One day while eating a bag of Trader Joe’s soft and juicy dried mango, I thought, this would be really good in a savory trail mix. 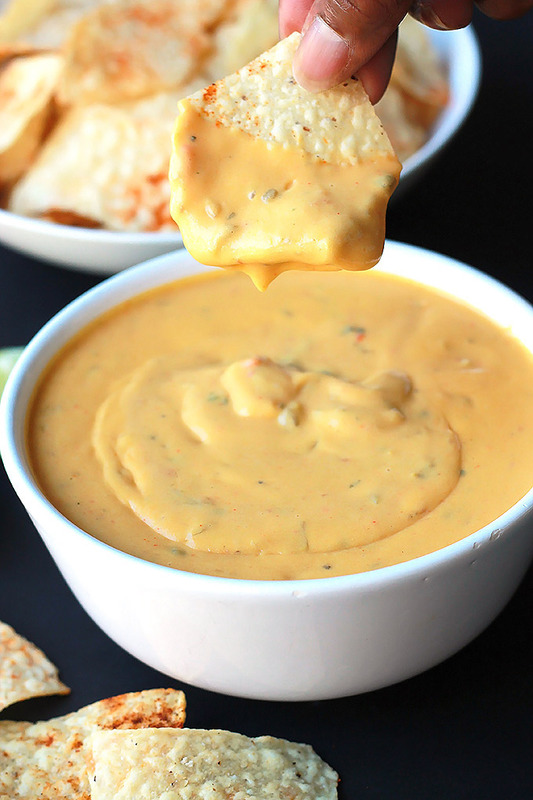 I remembered seeing a savory recipe on Kitchen Konfidence, a wonderful food blog I love, that included mango. 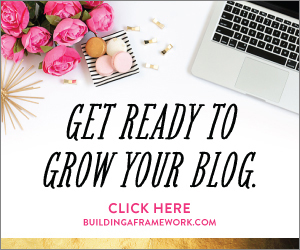 That’s the recipe that inspired this one I’m sharing today. 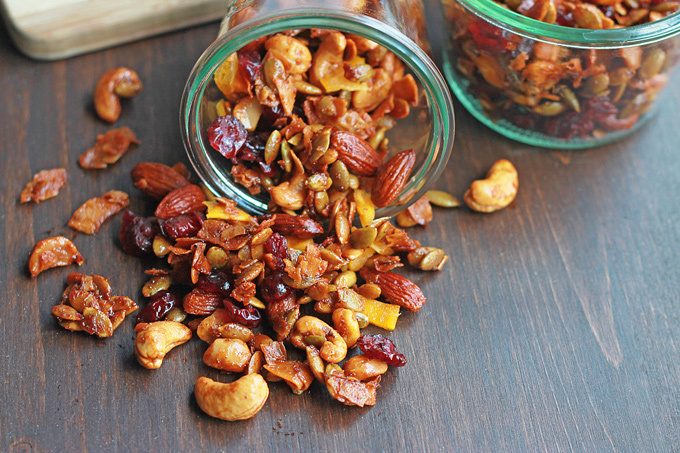 I generally don’t purchase trail mix, because I have a person in my home who is allergic to peanuts, and after finding peanuts in a trail mix that was supposed to be peanut free, I was convinced to make my own. 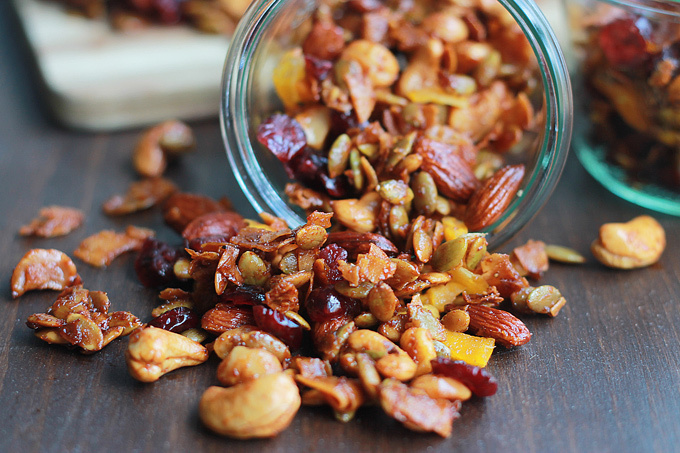 I used what I had on hand, which is what’s so great about trail mix recipes, you can make them your own. Look at that goodness! Spiced with chipotle chili pepper and carne asada seasoning and sweetened with maple syrup. It has just a subtle spiciness, for more spice add in more. Beware, this stuff is so good, it’s addicting. 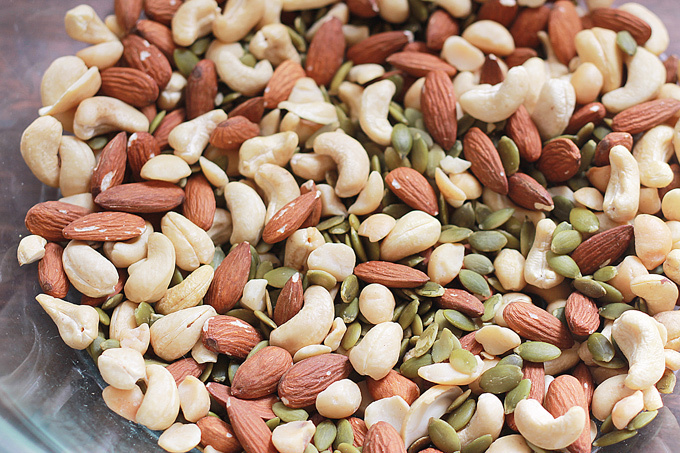 I packaged mine in small snack containers of 1/2 cup each for portion control. Preheat oven to 300 degrees, and line a large backing sheet with parchment paper. 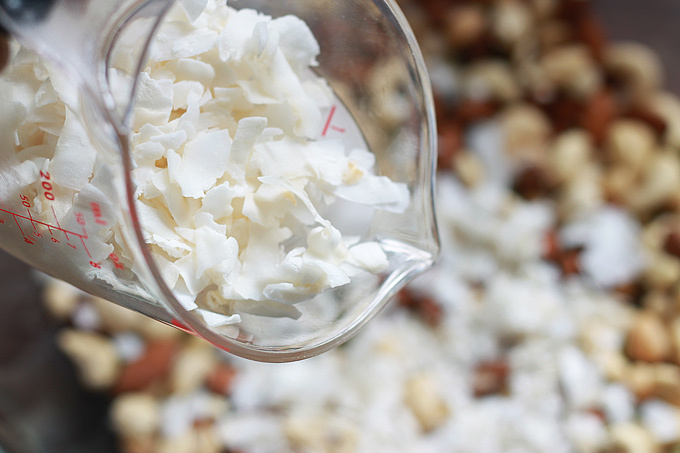 In a large bowl, mix together macadamia, pepitas, almonds, cashews and coconut chips. Warm vegan butter, maple syrup and seasonings in a medium saucepan until well combined and seasoning is dissolved. 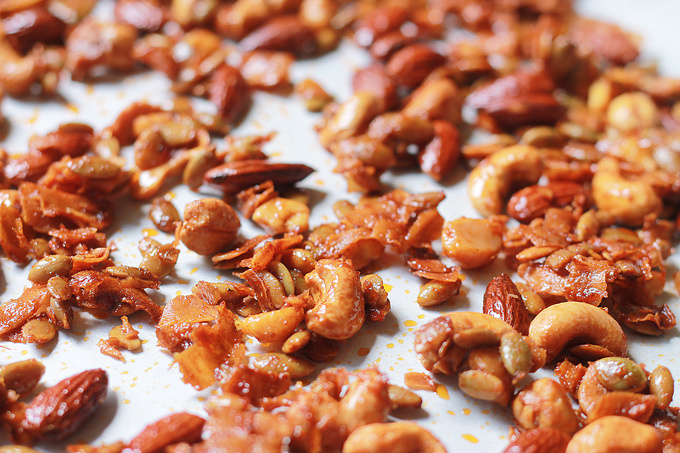 Spread onto parchment lined baking pan and bake for 30 to 35 minutes, or until nuts start to brown, tossing halfway through baking time. 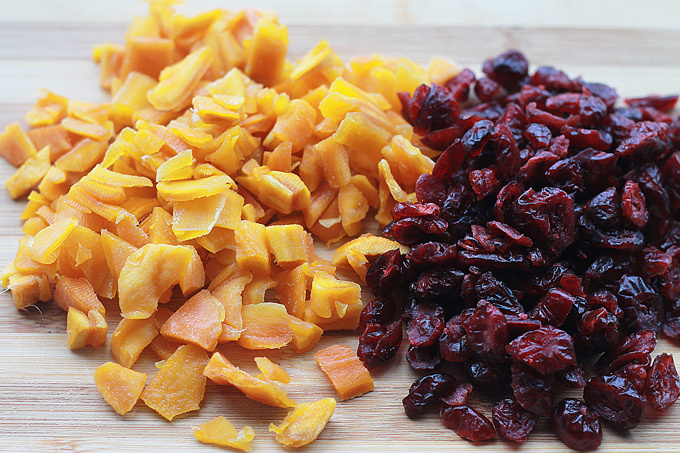 Toss in the dried fruit and store in airtight container. This looks amazing!!!! Beautiful photos too! Thank you so much, I appreciate your comment and thanks for visiting my blog.